As someone with a keen interest in coffee not working in the industry, it can be difficult at times to know exactly what information to seek out and where to find it, when looking to further develop my knowledge and understanding of methods and techniques to obtain the best results from my home roasting and brewing. Passionate baristas and café owners are always willing to chat, however understandably only have limited time when working in busy establishments. Although learning the coffee “cupping” process has been on my to-do list for some time, to date it hadn’t been ticked off. 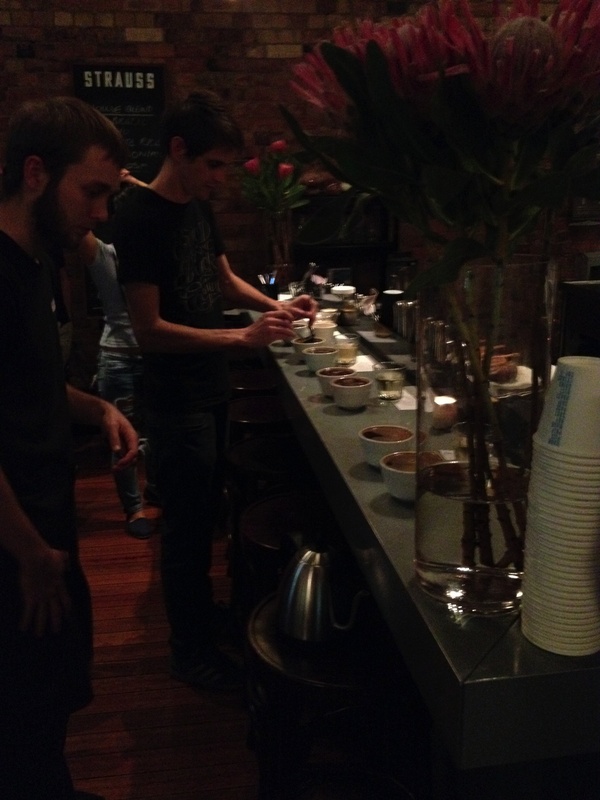 So when my ‘local’ cafe/bar, Strauss launched their consumer nights recently, I jumped at the chance to put my name down for the coffee cupping. Not experienced in the intricate nature of such techniques, I was hoping for a little assistance in this regard. There was certainly no need for concern, with the evening expertly run by Josh Russell, of local Brisbane speciality roaster Cup Coffee, who supply the Strauss House Blend along with an ongoing rotation of featured single origin coffees served through the espresso machine or by filter, with roast profiles to match. We were given an introduction into cupping techniques and tools (cupping bowls for the coffee; spoons for the slurp; take away cups for the spit). Firstly, the dry aroma, then breaking the crust and taking in the wet aroma, and finally onto the tasting. On offer were five different single origin coffees from South America, Central America and Africa, showcasing a diverse range of flavour profiles, which no doubt assisted our amateur palates in detecting some of the differences between each. Three of the five were familiar to me, having been served at Strauss in the recent past, however of particular interest was the difference between the flavour profiles when cupped, compared with brewing through filter or espresso based techniques. Some being similar, another very, very different. A final couple of runs along the cupping table to sample the changing flavour profiles as the brews cooled rounded off a very enjoyable evening. With an educational component to the evening, and participants recording tasting notes and encouraged to discuss our (somewhat limited) findings, this initial foray into the cupping process proved a valuable one. It has given me a better understanding of flavours, profiles (well-balanced vs higher acidity; different finishes), and how various descriptors apply to what I am tasting. The techniques? Well that will take further practice, however let us just say for this first event, I was pleased all the slurping and spitting didn’t simply coat me in what I was trying to taste, which going into this was a very real possibility. The most important things I took away? Probably the confirmation (which was expected) that despite continuing to learn more and more about this coffee caper, there is still far more I do not know, which only makes the process that much more enjoyable. Secondly, events like this, while a little daunting at first, when run well by those passionate about their craft, pique my interest even more, pretty much guaranteeing my attendance at similar events in the future – this was one such occasion. A highly informative and enjoyable evening, and if you get the chance to attend one of these events, I highly recommend it. For information on any upcoming events, keep an eye out on the Strauss Twitter and Instagram feeds.